Thank you very much for purchasing my first book on (black) tea! Enjoy your read, and please spread the good word! Please, feel free to contact me if you find some errors in the book, or if you want to send me suggestions on additional material that could be accompanying the book. I see him as rather burly. Similar proportions as my Uncle Sam character. His character seems friendly, outgoing, gentle sense of humor, well-informed. (Crossing Santa Claus + Scholar + Athlete + Outdoorsman). You can think of some actors and their movies if that will help get across the personality. Link to John Cox’s Kirkwood cartoon on tea, via my post, Kirkwood Tea Cartoon. 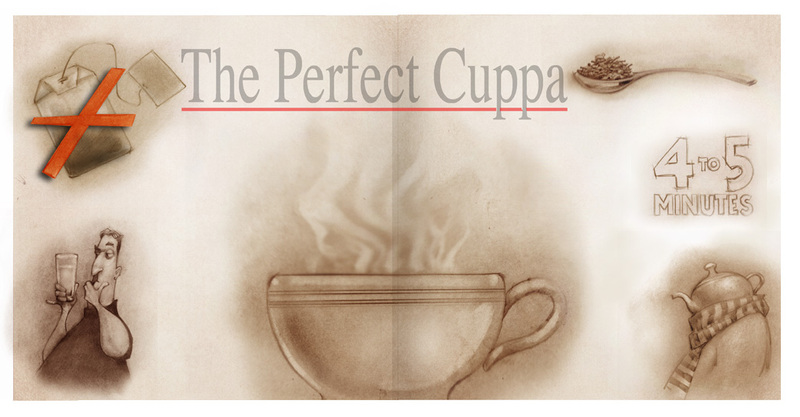 Link to video, Tea Making Tips by the Empire Tea Bureau (1941). Link to news article (The Sydney Morning Herald, July 1, 1941), R.A.F. Pilots Deliver Tea to Dutch. Link to blog post, The Year Britain Bought Up All the Tea in the World, by Peter KW Keen. Link to WorldAtlas.com with a list of the top 10 tea producing nations. Link to MyAssamTea.com with a list of the 15 top tea exporters and tea growing countries in the world. Link to the episode, Teakettle Acoustics (September 13, 2016), of the podcast, Pulse of the Planet. Link to the post, A British analysis of the physics of a tea kettle whistle, on Improbable Research blog (October 24, 2013). Now then you have read the above reviews of my first book on black tea, I would appreciate it very much, if you take some time and write a review on Amazon. Thanks in advance for your testimonials! Stay in touch via Facebook Messenger! If you have donated to the crowdfunding campaign, or bought a copy of the book, please send me a proof of purchase (receipt, order confirmation, etc.) of the hardcover edition of the book, and I will give a special deal on the e-book, so you could have an electronic version of Tea Book Sketches on your mobile devices. Do you want to get a virtual “gold ” and a tea gift IRL? Take a selfie with the book, or/and a photo with the book during a tea related moment in your life, and I will retweet it on Twitter, repost it on Instagram, or/and publish it on Facebook. Include the hashtag, #teabooksketches in the picture and tag Tea Book Sketches, or/and Lyceum, in order to have a searchable image.